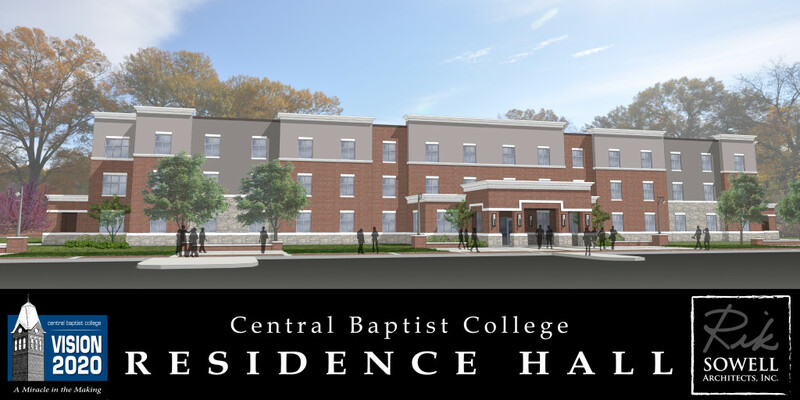 Ground has been broken on a 150-bed residence hall on the south end of the Central Baptist College campus. The new residence hall, to be built facing west on Conway Boulevard, will be the first student housing project to be conducted on the CBC campus in 49 years. The project was made possible by a lead gift from Max and Debbie Story from Magnolia, Ark. The $6.7 million residence hall will be three stories with design elements that include: generous main lobby space on the ground floor for student games, lounging, movies and group study; a covered main porch entry area, Resident Director apartments, study tables and chairs, lounges on each floor, patio space, private bathrooms, and exterior plaza space for students to congregate. The design and construction team is comprised of Sowell Architects, Inc. of Conway and Clark Contractors, LLC of Little Rock and is schedule to be completed by August 2014. The new residence hall is the third major project of ten to be funded by a capital fundraising campaign entitled “Vision 2020: A Miracle in the Making.” CBC President Terry Kimbrow explained, “Vision 2020 is a plan to complete 10 major projects in 10 years to accommodate an enrollment of 2020 students.” The campaign was publically launched in January of 2011 and has exceeded $16 million in contributions.